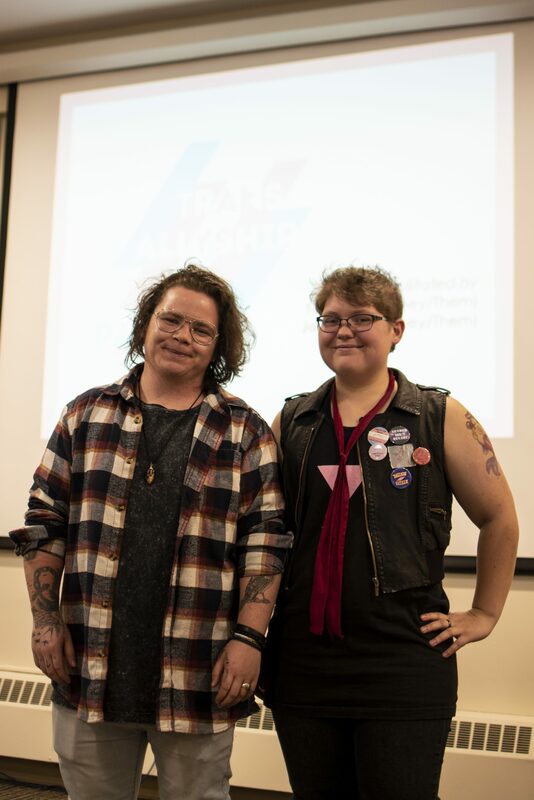 On Thursday, Oct. 25, the WLU Rainbow Centre hosted part one their annual Trans Allyship workshop series, taking place at the Paul Martin Centre. The workshop was facilitated by trans community organizers to give participants the skills and knowledge necessary to be able to practice allyship with trans students within our community. “Trans Allyship is a workshop that was created by the Rainbow Centre volunteers, a coordinator from a couple years ago, and it’s updated every year, but the purpose is to sort of help bring that basic knowledge into the wider community, especially when you’re in this space [The Rainbow Centre] all the time, it’s really easy to just assume everyone knows things,” said Milas Hewson, administrator for the Rainbow Centre, part of Laurier’s Diversity & Equity Office. The Rainbow Centre is a safe space on the Waterloo campus for students, faculty, staff, administrators and visitors who are LGBTQ+ identified, queer-friendly or allies, with their Brantford counterpart being the Queer Sphere. The Rainbow Centre runs many programs like events such as these workshops, hosting speakers, having open discussion forums and other resources to bring research, awareness training and education to students on campus. “Even just the number of times I’m surprised by people not knowing something that I think is common knowledge, I think that’s what makes trans allyship so valuable, it gives us an opportunity to give that basic education and put it out there, invite people into the conversation,” Hewson said. The Rainbow Centre is part of the Diversity & Equity office, which works with many different centres and associations on campus that aim to cultivate an inclusive culture on campus where students can feel equal and safe, as they provide not only support for students who are feeling marginalized, but also provide education to all students to ensure people on campus are treating each other with respect. “I think especially within academic communities like this, sometimes marginalized voices tend to have the hardest time, and that’s compounded on layers of marginalization; there’s trans folks, and then there’s trans folks of colour, and then there’s trans women of colour. I think it brings a bit more basic knowledge into the community, it invites people to have these conversations and just be aware. A lot of people don’t think about these things from day to day, and just seeing that there’s a poster for trans allyship, people think ‘Oh! Trans people on campus, that’s a thing that exists,” Hewson said.